Bob Johnson's Rants and Raves: New Years Resolutions.....???? According to this article, 97% of everyone that make a Resolution will fail within 30 days. 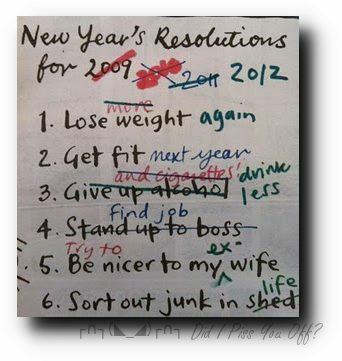 So why make a resolution at all? In my opinion, it is just like the Christmas Spirit thing. People are cows. Have you ever been to a Dairy Farm? 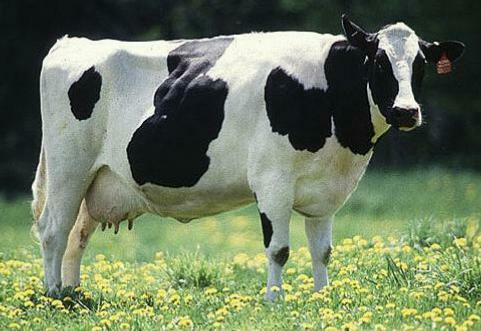 At a Dairy Farm, the farmer will put cows on a feed and milking schedule. Now cows aren't all that smart. After all, the reason we eat them is that horses out-run us. Cows will line up to be milked in the same order everyday. They will eat from the same area of the feed bin everyday and of course sleep in the same stall every night. All this without direction from the Farmer. This is just like people. The mainstream media will announce that it is time to celebrate New Years by having shows about resolutions and new beginnings etc. Heck the exercising industry has been capitalizing on our stupidity for years. Have you ever noticed that there are a lot of advertisments about exercise equipment in December and January? Stop it! 1. Stop Smoking - I do not smoke so this is not a problem. 3. Lose Weight - the Battle of the Bulge - I workout all year and do not have a problem with weight. 4. Enjoy Life More. - I enjoy life all year long. 5. Quit Drinking - Whaaaaaa...... Thats just crazy talk. 7. Learn Something New - Learned everything I need to know in Kindergarten. 8. Get out of Debt - I'm so deep that there is no hope. 9. Spend More Time With Family - Already spend all day, everyday with my wife. Kids are overrated. 10. Help People. - I help people with my blog! So people, I say stop following the cow in front of you. Stop eating from the same area of the feed bin. Unite and stop the insanity of these trivial, media driven, holiday "Traditions". So what am I suggesting? Well I say when that ball drops in Times Square, grab your significant other and kiss them.